Optimistic estimations of peak production forecast the global decline will begin by 2020 or later, and assume major investments in alternatives will occur before a crisis, without requiring major changes in the lifestyle of heavily oil-consuming nations. Pessimistic predictions of future oil production operate on the theory that either the peak has already occurred, we are on the cusp of the peak, or that it will occur shortly and, as proactive mitigation may no longer be an option, predict a global depression, perhaps even initiating a chain reaction of the various feedback mechanisms in the global market which might stimulate a collapse of global industrial civilization, potentially leading to large population declines within a short period. The first day you catch one fish, the second you catch two fish, the third three fish. You become a better fisherman everyday. You catch more and more fish. But at some point the fish in the pond start running out. You cannot continue to catch 20 fish if there are not 20 fish left in the pond. ​Population pyramids are graphs that show population structures, ie how many males and females of different age groups are in the population in each place. Population structures change from place to place and over time. The population pyramids for the country on the right are different shapes. The pyramid for Kenya has a very wide base. This means that there is a high proportion of young people. The top is quite narrow which means there are fewer people in the older age groups. This type of pyramid is more likely to occur in a developing country where birth rates are generally higher. What can we tell about the population structure of the shape of population pyramid? A wide base means there are lots of young people, and suggests a high birth rate. A narrow base means a smaller proportion of young people, suggesting a low birth rate. A wide middle, tall pyramid means an ageing population, suggesting that there is a long life expectancy. American geographer, Warren Thompson, developed this model in 1929 in NYC in the midst of the stock market crash and onset of the Depression. It is used to understand population policies and changes in developed and less developed countries around the world over time. Easy to apply to all countries even though rates vary due to cultural and economic conditions. Models available for all the countries of the world, although there is much variety in the way in which it applies. 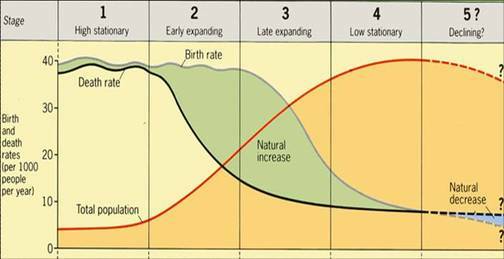 Why doesn’t the pattern of Demographic Transition Model work for all countries? Many factors affect death rate such as; famine, natural disasters, war. DTM assumes all countries will go through stages in a certain order. Many countries in Africa seem to be in Stage 5 due to the HIV and Aids epidemic. In the past, developed countries began transitioning in the 18th century and continue today. Today the less developed countries began later and are still in the midst of earlier stages. Western European countries took centuries while rapidly developing countries (ie Asian Tigers) are transforming in decades. Migration has become a huge political issue in the United Kingdom and has been cited as one of the main reasons why the majority of British people voted to leave the EU. Tabloid newspapers and TV shows focused specifically on the influx of people from eastern Europe to the UK. In this activity we will assess the reasons for Polish people migrating to the UK and the impacts, both positive and negative it has had on the the UK.